Now we need to Export the Certificate in a particular format to use with the PHA Servers. We should not use the Export option available in the Certificate window. This will include the private key and not compatible with PHA deployment. For exporting, double click the Certificate. In the appearing window choose the Details tab. Click the Copy to File button. You will get the following wizard. In the next page choose not to include the private key. Leave the other page values as default. Enter the file name for the Certificate. Click the Finish button to complete export. Now you need to copy the exported certificate file in further steps. Durable Links is a great feature introduced to SharePoint 2016. Once we create a document, share the document url, move the document to another location, the links become invalid! This is a common problem across IT as there will be bunch of document links created over the years & becoming invalid. SharePoint 2016 solves the problem using Durable Links. Durable Links are created based on the Unique Document Id. Durable Links helps Document Renaming, Document Relocating easier without breaking links. We need to activate Document ID Service from Site Collection Features to make Durable Links work. We need to start configuring App Catalog before users can use it. You will get the following page. We need to create a new App Catalog. Click the OK button to continue. In the appearing page enter the Administrator info & Click OK. Your new App Catalog site will be created. Now you can try opening the App Catalog by clicking the URL. You will see the following page. SharePoint Framework (SPFx) was introduced in early 2017 and it is the Preferred Development Method for SharePoint 2016 and SharePoint Online. As an early starter with SharePoint, I would like to list down the SharePoint Development models from my mind. This was the Initial development world. It consisted of C# code in DLLs running in the server-side. Later this led to issue of Full Trust and Poor code affecting whole server. SharePoint 2003, 2007, 2010, 2013 had full support for Farm Solutions. Then came the Sandboxed Solutions which tried to resolve some of the Farm Solution issues. Sandboxed Solutions set Trust configuration, Restricted Code, Quota Limit there by preventing a Poor Code from hampering server. Still the code runs in Server-side leading to performance issues when a large number of users using a Dashboard web part for example. Here the C# code will be executed on SharePoint server. 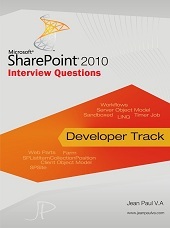 SharePoint 2007, 2010, 2013 had support for Sandboxed Solutions. Client-Side Object Model (CSOM) was developed to address few of the Sandboxed Solution issues. CSOM still uses C# code but can be executed outside the SharePoint server. This freed up the SharePoint Server from unwanted loads and also relaxed on the Deployment overheads with just referring to Client Side DLLs. SharePoint 2010, 2013 supported CSOM. JSOM also supported Batching which was earlier boon to reduce server roundtrips. SharePoint 2010, 2013 supported JSOM. Apps (Now Add-ins) was introduced in SharePoint 2013 to package & publish complete applications to Corporate or Office 365 store. In this way the client side support was extended to business level. Apps came with SharePoint Hosted Apps (SHA) initially. Apps also provided PHA (Provided Hosted Apps) which allow running C# code in outside servers. Apps were using IFrame and thus cause redirection & page load delays. SharePoint 2013, 2016 supported Apps. SharePoint Framework (SPFx) was introduced in SharePoint 2016 to address the problems with Apps. There are No IFraames thus increasing the Page Performance. SPFx also comes with ready made reusable web parts for common functionalities. SharePoint 2016 introduced Webhooks for List Event Handling. Webhooks are much better than Remote Event Receivers. You need an Office 365 Subscription to test Webhooks. The class need to be inherited from SPWebhookNotification class. The class should implement properties for SubscriptonId, ClientState etc. Http Post attribute should be used for the receiver method. After the Zone Configuration, We need to Configure App URLs. Follow the steps below. Enter the Zone Names here. Save changes. Now you can proceed with next steps. In this article we can explore Compatibility of Sandboxed Solution with SharePoint Online. I am seeing that many developers are recommending Sandboxed Solutions for On-Premise and Online deployments. But, the Twist is that SharePoint Online does not support all sandboxed solutions. So if your solution has a Strategy Architecture comprising of SharePoint Online, you need to be really careful recommending Sandboxed Solutions. NCSS contains only HTML & CSS markups. No code will be there. NCSS is the recommended & only allowed one in SharePoint Online. Create a new Sandboxed Solution. Add a Visual Web Part. Do not add any code. Build the project. Now come back to Visual Studio & Add place a button on the Visual Web Part. Add code to the click event handler. Now upload the Coded Sandboxed Solution to SharePoint Online. You can see the Activate button is disabled. So this demonstrates that SharePoint Online does not support Coded Sandboxed Solutions. Sandboxed Solutions were the Solutions of the past and now being deprecated. In the modern SharePoint development world REST, CSOM, Apps are the recommended approaches. Plus, there is a risk that Sandboxed Solution can get disabled in future versions of SharePoint/Online. In this article we have explored Compatibility of Sandboxed Solution with SharePoint Online. Few months back I came across a scenario where User wanted to play Video in SharePoint Pages. But the Environment restricts usage of Video Streaming. In this case we can use HTML5 Video Tags. HTML5 included the Video & Audio tags which allows playing multimedia without any extra plugin requirement. Previous to HTML5, Flash Or Media Player was required to play video Or audio files. Now all HTML5 compatible browsers support the Video tag by incorporating necessary multimedia infrastructure within them. Following are the Browsers & Versions supporting HTML5 Video & Audio tags. Coming back to our problem, Perform the following activities for testing the Video tag. Open SharePoint Designer. Go to Site Pages. Choose the new HTML or ASPX option. Edit the file. Add the following code inside body tag. Your code in HTML file looks like below. Now we need to create a video file. You can download the Video file from link below. Choose the MP4 file, download, rename & upload to Site Assets library. Now open the HTML file in a Video supported browser. You will get the video played as shown below. Now open the HTML file in a non-supported browser. You will see the following error message. You can also set a Preview Image for the Video tag. This image will be displayed in the non-play state. In this article we have explored using Video Tag for a restricted SharePoint environment scenario. In this article we can explore how to Download & Install the claims viewer web part for SharePoint 2013. You will get the WSP file. The web part is Free for development & commercial use. Once you have downloaded the WSP file, you need to install it. This is a Farm Solution so you require PowerShell. Go to your SharePoint Server & Open the PowerShell window in Administrator mode. You will get the following command window. Run the following command to add the WSP package to Farm Solutions. If things went well, you will get the following message. Now run the following command to install the WSP package. If things went well, you will the following output with no error messages. Now you can come to your SharePoint site > Go to Site Collection features > Activate the following feature. Once you have activated the feature, you can add the Web Part to a page. Create a new page & choose the Insert web part option. You should be able to see the Claims web part as shown below. Insert the web part & Save the page. You are ready to use the Claims Viewer web part. Your claims may be different from the items shown above. In this article we have explored how to install the Claims Viewer web part. In this article we can explore the Claims Viewer Web Part. I was working in a Claims enabled SharePoint Web Application where I felt the need of a Claims Viewer component which could display the current claims of the logged-in user. An example is displayed below. The above component is developed as a Web Part and requires Farm Solution for deployment. The C# code runs in the server-side and renders the claims values to the output. Following is the code which retrieves the claims. Once the user is logged in, the thread will contain the Claims Principal object. We can get the Claims from this object. You can use the References for articles on Installation of the Claims Viewer web part. In this article we have explored the usage of Claims Viewer web part.